Native to the Mediterranean region, fig trees perform well in Louisiana's subtropical climate if chosen well and tended carefully. Louisiana growers must exercise caution when choosing a fig variety: fig trees that need the fig wasp for pollination cannot grow in Louisiana, nor can open-eyed fig types since they can crack in humid weather. 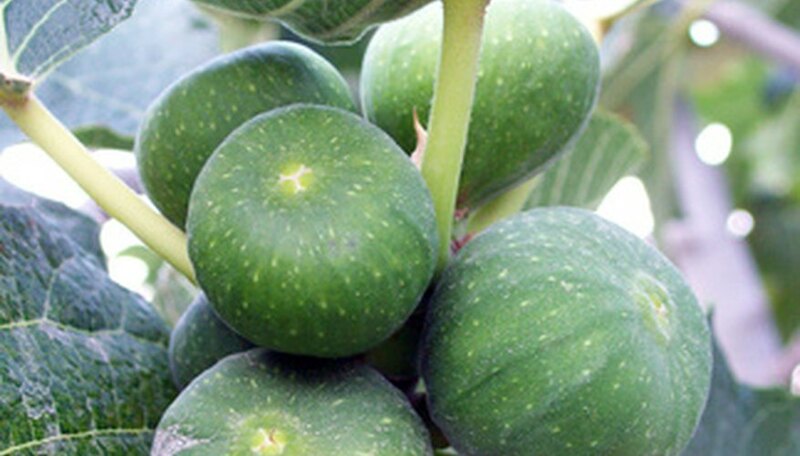 Louisiana growers can choose brown or green figs and use the fresh fruit for eating, jams, baked goods or preserving. Choose a recommended fig cultivar for Louisiana in late winter to early spring, while figs are dormant. Louisiana Ag Center suggests Celeste, Kadota, Brown Turkey, LSU Gold, Champagne, Alma or LSU Purple; these are closed-eyed and do not need fig wasps for pollination. Select a location for your fig tree that offers full sun and well-draining soil. Mature trees can reach 30 feet in height, so select a site that offers enough space for the mature plant. Dig a hole that's deeper and wider than the container holding your fig tree. Remove any rocks or weeds from the hole. Jab your shovel at the bottom of the hole to loosen up the dirt; this will help the fig tree adapt. Remove your fig sapling from its container by pulling gently on the trunk. Massage the root ball with your fingers to break it up. Examine the fig tree's roots. Untangle any tangled roots; unwind the roots if they've becomes circled from being in the container. Cut back any broken or smashed roots using scissors. Place the fig tree in the hole you prepared and spread the roots out with your fingers. Fig trees perform best if settled 3 to 4 inches lower than they were in their container. Cover over the hole with soil but don't press the soil in. When the entire hole is covered, water the fig tree thoroughly until the soil compacts around the hole and becomes saturated. Mulch the area around the fig tree with mulch or pine straw. Scatter 2 to 3 inches of mulch around the base of the tree in a 2 foot circle. This helps keep moisture in the soil. Watch the fig tree leaves for signs of wilting. When you see the leaves slightly wilt, water the fig tree until the soil becomes saturated. Fig trees need sufficient water, but too much will cause fruit splitting. Fertilize fig trees using 2 to 3 cups of 6-6-6- or 8-8-8 fertilizer three times a year. Protect young fig trees in the winter during a cold spell of temperatures below 20 F by wrapping them entirely in burlap. Pin the burlap together as you wrap it around the branches of the tree, then wrap it all the way down to the trunk. Louisiana only experiences freezing temperatures very rarely, so gardeners will not have to do this regularly, but having a sheet of burlap on hand will help protect fig trees in the rare instance when it's necessary. Prune out dead, diseased or damaged growth annually. Dead growth will feel hollow while diseased and damaged growth is often discolored or scarred. Aside from this maintenance, figs need little pruning. Gardeners can prune out old woody limbs that produce little fruit if they so desire.